The Belleek Trinity wall plaque was introduced in 2015. 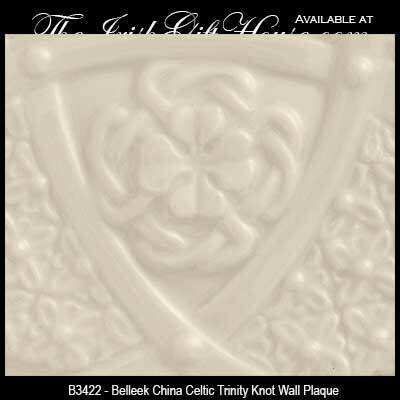 This Celtic wall plaque features Belleek's hand painted green shamrocks on the embossed Trinity knot shaped design which includes a center four leaf clover that is surrounded by additional Celtic knot-work. The Belleek plaque measures 6 3/4" long x 6 1/2" wide and is ready to hang on your wall; the Trinity plaque hand crafted and hand-painted in Belleek, Ireland. 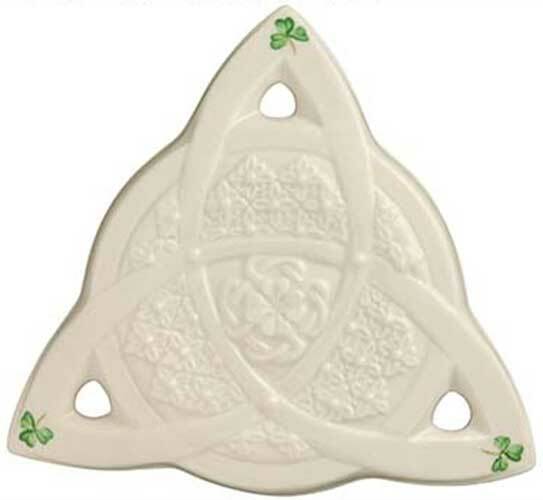 The Belleek Trinity plaque is gift boxed with Celtic knot and shamrock history cards, complements of The Irish Gift House.